The NextBit Robin is now available for pre-orders. The device was unveiled early last month after a successful Kickstarter campaign, and features 32GB of internal storage along with 100GB of cloud based storage. The latter starts to come into play when you are close to capacity with your built-in storage. Once that happens, rarely used apps and data are sent off into the cloud. 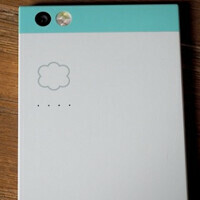 The NextBit Robin has an impressive pedigree. Working on its design was Scott Croyle, who once toiled for HTC, and helped design the HTC One (M7) and HTC One (M8), among others. Nextbit CEO Tom Moss was one of the founding board members of Cyanogen, and other NextBit employees are former Googlers who worked on Android. The NextBit Robin is available in a CDMA version for Sprint and Verizon, and a GSM model for AT&T and T-Mobile. Both will cost you $399, and can be purchased in Mint or Midnight. Shipping costs are listed on the website, and it will cost you $25 to have the phone delivered to the U.S. The website (which you can reach by clicking on the sourcelink) also includes a list of accessories including a Quick Charger ($10). The phone is expected to ship in February. The device carries a 5.2-inch display with a 1080 x 1920 resolution. The Snapdragon 808 SoC is under the hood, including a hexa-core CPU and the Adreno 418 GPU. 3GB of RAM is inside. A rear-facing 13MP camera is aboard, as is a 5MP front-facing camera for selfies and video chats. Keeping the generators humming is a 2680mAh juicer, with quick charging capabilities. The NextBit Robin offers front-facing stereo speakers, and a side-mounted fingerprint scanner. It also supports NFC and Global LTE bands (1/2/3/4/5/7/8/12/17/20/28). If you want more than just your head to be in the clouds, take a look at the NextBit Robin. And the dual-speakers, and way way WAY better-looking design. Not to mention lower price. Shame it's not stock, I couldn't care less about being "cloud-centric." Bring back Google Play Edition for this phone only, Google! The 5x has the bigger battery and probably better camera though. And I believe the 5x is cheaper overall and has stock android. $430 5X 32GB vs. $400 Robin 32GB, at least in the US. I'm not counting the 16GB 5X. Don't count out the camera, they said they couldn't have spent more money on the camera if they tried (which I call BS on, because you can ALWAYS spend more money, but even so.) Also, are you really going to argue there is ANY meaningful difference between a 2680mAh battery and a 2700mAh battery? That's less than 1% difference between the two. Looks like a child's toy. If I'm paying $400 for a phone I don't want it to look like its made from Playskool. I think it has potential & am considering purchasing one.The guys running the company are all from well know big players so I'm excited for this phone and hope they succeed. It looks sturdy. My issue is non replaceable battery & no expansion slot which I guess they've offset with the accompanying cloud storage. I think it's solid. Five years of phone life sounds good to me.